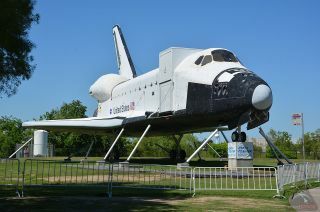 The full-scale space shuttle replica at Space Center Houston will be christened during an Oct. 5 public ceremony. The Oct. 5 christening ceremony is free for the public to attend. According to Space Center Houston, the first 1,500 visitors that day will receive a commemorative souvenir in celebration of the "momentous event."